is a high precision dual mono or stereo low and highcut filter with active gainstage for your live acts, mastering or generic studio use. Build in a hand-crafted small series based on true discrete analogue FET input and output stage. 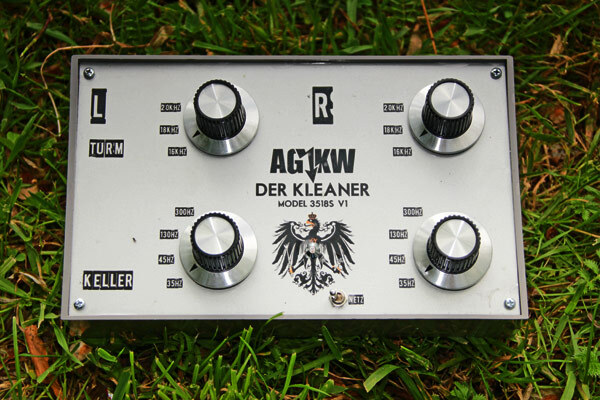 DER KLEANER MODEL 3518S V1 – no more available! This entry was posted in AG-KW TECHNIK and tagged ag-kw, agkw, analog, analogue, bessel filter, butterworth filter, discrete analogue, fet, filter, gainstage, hardware, highcut, kleaner, lowcut, studio, techno on 07/08/2012 by agkw.